The tricolored (red, blue and white) edifice is our school gymnasium built in 2009. It is named “UDIUM” which symbolizes Sports in Urawa Gakuin High School. 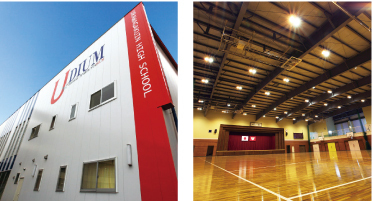 This gymnasium is used for sports club activities like basketball, badminton, volleyball etc. and student assemblies, as well as P.E. classes. There is also a large gallery space in the 2nd floor with fully-equipped rooms for each club to use. This dormitory was built in March 2016 as an international guest house and an accommodation for students belonging to our soccer club. “NEXU” was derived from the Latin word “NEXUS” which means “connection, like or tie”. It was named by one of our students hoping to express nexus between our school and foreign countries, and between our soccer team and other soccer teams. The dormitory is consisted of two three-storey buildings—International Dormitory and Soccer Dormitory. “ULT”, which is an abbreviated name of “Uragaku Literacy Tower,” symbolizes Academics. Students and teachers use this library in regular classes, after school, during break time and anytime they want to research and read books. We have two librarians who welcomely assist students and visitors. Urawa Gakuin uses this ground for clubs and other extracurricular activities such as student assemblies. The ground can also be used freely during lunch break. A large space is surrounded by the natural greenery. This ground is used not only for P.E classes but also for various kinds of club activities for students to maximize their activities. The generation today is also the “evolution” of Information Technology. 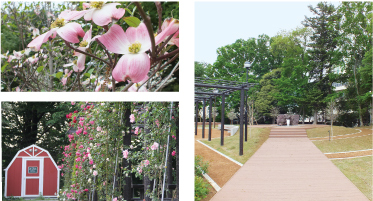 Urawa Gakuin High School provides a fully-equipped environment for students who want to take up courses or degrees related to Information Technology. Our cafeteria offers a wide variety of healthy menu which are available every day at affordable prices.